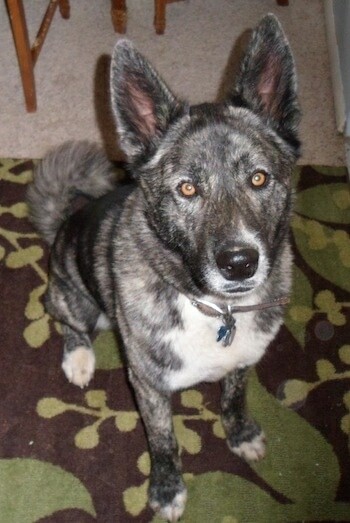 "Abby is a 2-year-old gray and black brindle Huskita. She is the ideal babysitter and will watch little kids, puppies and cats and keep them out of trouble. She acts a lot like an Akita but talks a lot like a Husky. She is sweet and likes to go camping and swimming. 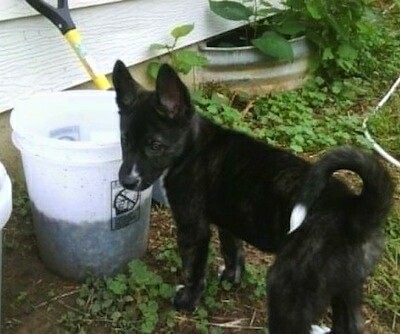 She is 85 lbs., so the weight of a small female purebred Akita." The Huskita is not a purebred dog. 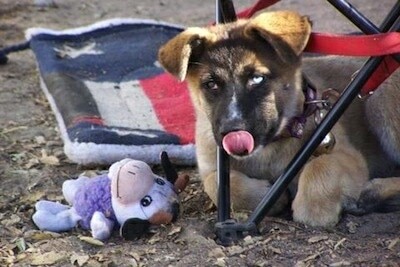 It is a cross between the Siberian Husky and the Akita. The best way to determine the temperament of a mixed breed is to look up all breeds in the cross and know you can get any combination of any of the characteristics found in either breed. Not all of these designer hybrid dogs being bred are 50% purebred to 50% purebred. It is very common for breeders to breed multi-generation crosses. "I took this photo of my dog Zar when he was a puppy during one of my Sheep Herding Classes I was taking with my Border Collie Drewsilla. He insisted on lying underneath my chair (which was in the shade) no matter how tangled he would become. (A very determined and persistent li’l fellow!) 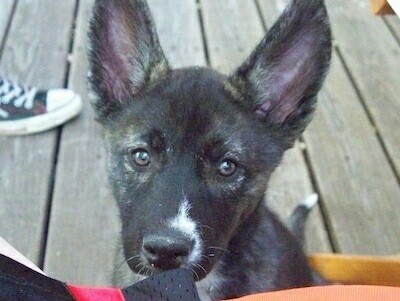 Zar is 3/4 Husky and 1/4 Akita."